I began training my first dog in agility 13 years ago; since then I have become a top competitor in the sport and have altered my life to be involved with dog agility full time. An Engineer for 13 years, I quit that career in 2000 to become a full time agility instructor. I currently have two dogs, one of them a mixed breed, and am competing at the top levels of the sport with all of my dogs. You may even have seen my dog Sandy and myself on television, as we have been on several invitational events. I have competed with my dogs in the USDAA, NADAC, and CPE Nationals Championships; Sandy won the NADAC Championships in 2002 and CPE Nationals in 2003, and Crystal won the CPE Nationals in 2002. Crystal, my first dog, who passed away in 2006, was a Border Collie/Husky mix. 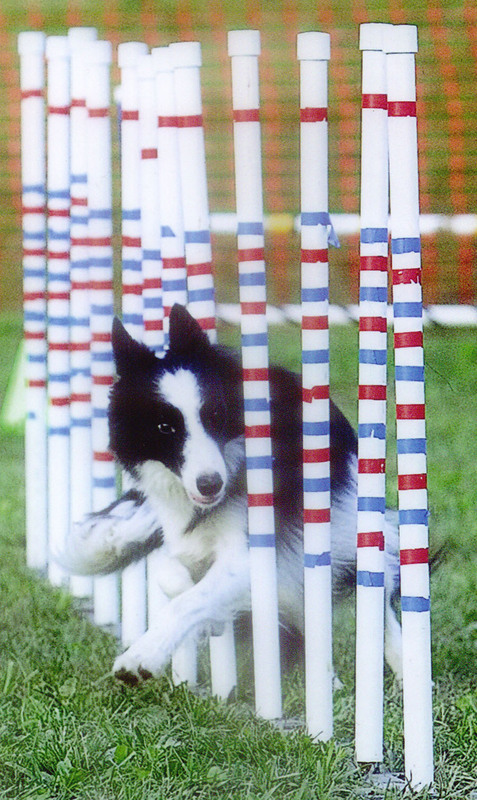 She got me started in Agility in 1995. When we first started, as I was completely new to the sport, I made the mistake of not making every aspect of Crystal’s early training an absolutely fun experience. As a result, Crystal was a slow, unmotivated dog for more than three years. But eventually, through lots of retraining and perseverance from myself, Crystal regained her original enthusiasm for the game! Crystal earned the NADAC Elite Veteran Regular, Gamblers and Jumpers titles; USDAA Performance Dog III title; CPE C-ATCH title; and UKC Level 1 title. 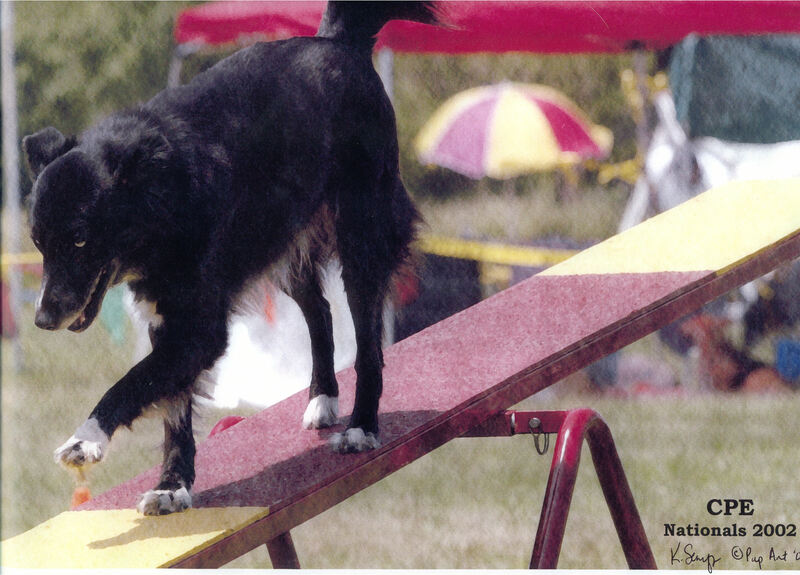 Plus, she took High in Trial and High Veteran in Trial at the 2002 CPE Agility Nationals, and finished third at the 2002 AMBOR Mixed Breed Nationals. She also obtained the level 2 APDT Rally Obedience title later in life. Sandy, who passed away this April, was an “All-American” – probably Rat Terrier mixed with Whippet and Beagle. Sandy obtained her ADCH (USDAA Agility Dog Champion); S-NATCH (NADAC Superior Agility Trial Champion); held the 8th C-ATE (CPE Agility Team Extraordinaire); was in USDAA’s Top Ten Jumpers and the Performance Top Ten in Standard, Snooker and Gamblers; is in the CPE Top 10 Lifetime Top Ten; won the CPE Nationals in 2003; won the NADAC Championships in 2002; finished second at the 2002 AMBOR Mixed Breed Nationals; and competed for several years and was a finalist in the 2000 Purina Incredible Dog Challenge. A rescue, Sandy came to me with several insecurities. I only started agility with her to help develop confidence; originally I had no intention of competing with her, but that changed when Sandy took to the sport and gained confidence, and was obviously having the time of her life. Buddy, my 9 year old Border Collie, was also acquired from rescue. Even though he was confined to a crate for the first 8 months of his life, with a little TLC from both the original rescuer and then from myself, he blossomed into a wonderful and typically high-drive BC. So far he has earned the USDAA MAD (Master Agility Dog); CPE C-ATE (Agility Team Extraordinaire); AKC OA and OAJ Titles; and NADAC Elite Regular, Gambles and Jumpers Titles. By the way, I am only the third handler in CPE history to get a CPE C-ATE with multiple dogs! Jart is a 6 year old All-American (perhaps a mini-aussie, perhaps a Border Collie/Papillion mix). He spent the first year of his life in a “collector home” with 70 other dogs until he was rescued. He’s scared of strangers, but loves other dogs and life in general, and took to agility the moment he was introduced to it. He currently has his USDAA Starters Gamblers, Snooker and Jumpers titles, and is in level 5 in CPE. He has gained tons of confidence and now attacks agility courses with abandon!